Decision Day is here. And frankly, there are six teams with an argument and Year One of football’s version of a selection process will not be clean after all. First things first, the College Football Selection Committee is a distinguished group of people who want to get this right. They have been tasked with a difficult process, and yet have been chosen because of the level of integrity they bring. While reasonable minds can disagree, they have a tough decision and whatever it is it should be respected. I have repeatedly stated that I like to know my path to the playoff going into the season. In college basketball, I know if I win my conference tournament, then I’m making the NCAA Tournament. If I don’t, I’m at the mercy of the selection committee. We can revisit that at another time though. By KPI Rankings, the math projects Alabama vs. Florida State in the Sugar Bowl and Ohio State vs. Oregon in the Rose Bowl. But first, the obvious. Whichever two teams (at least one of which will likely be a Big 12 team) are left out of the playoff will have a legitimate gripe. Deciphering the cut line is splitting hairs. 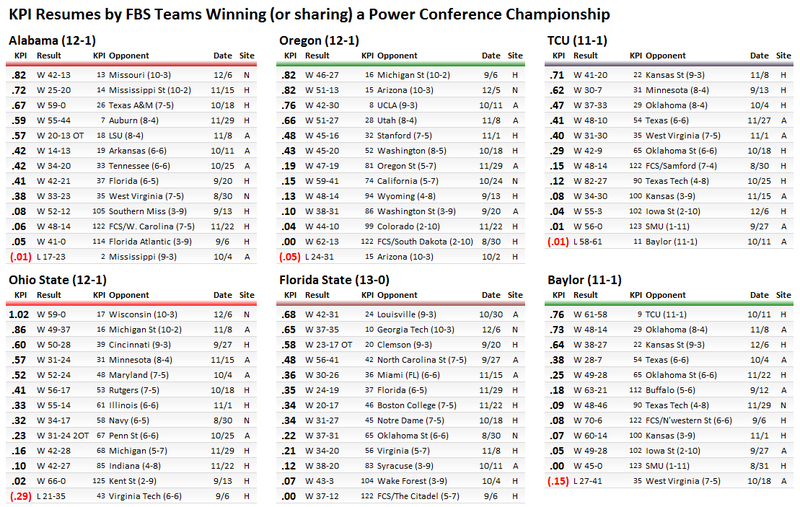 There are several power conference teams at 6-6 (or even 7-5) that will be left without a bowl game. There are more bowl eligible teams than bowls. There are many bowl games matching up Power 5 conference teams against one another and pairing up Group of 5 teams, with few crossover matchups between the two groups. The Eliminator: The Eliminator assumes (not necessarily justly) that a Power 5 conference team with three or more losses and a Group of 5 team with one or more losses will not make the playoff. Under that assumption, 8 teams remain in play for the postseason playoff. I know. It ended up exactly eight teams. That wasn’t by design, and it won’t land this clean every year. Combined Offensive and Defensive DIFFs (Averaging Offensive and Defensive DIFFs). Offensive and Defensive DIFFs (along with all team numbers) are available here.